Recruitment websites have been well entrenched overseas and in neighbouring countries and add value to the recruitment practises of companies globally. The use of recruitment websites has the distinct advantage of targeting and finding ideal job matches by encouraging qualifying job seekers to apply for positions. Additional value added services include- assistance with advertisement creation, automated screening and regret function, bookmarking talented applicants for future consideration, in-house vacancy advertisements, etc. Namrecruit also enlists the services of certified industrial psychologists and various other recruitment specialists and will therefore also assist you with various psychological tests to ensure that your appointment is the correct one. The website does not only cater for large companies seeking recruits but covers the whole spectrum from unskilled job seekers to executive level seekers. It includes functionality for job attachments, fix term contract work seekers, part time work seekers and bursary seekers. 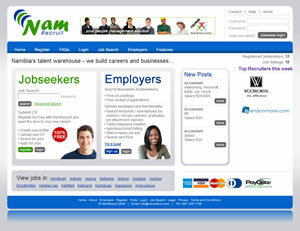 Logos of top employers / recruiters displayed on home page etc. Namrecruit also enlists the services of certified industrial psychologists and various other recruitment specialists and will therefore also assist you with various psychological tests to ensure that your appointment is the correct one.